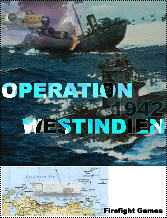 Operation Westindien simulates the devastating effects of the German U-boats in the Caribbean from Feb. 16 to March 16. 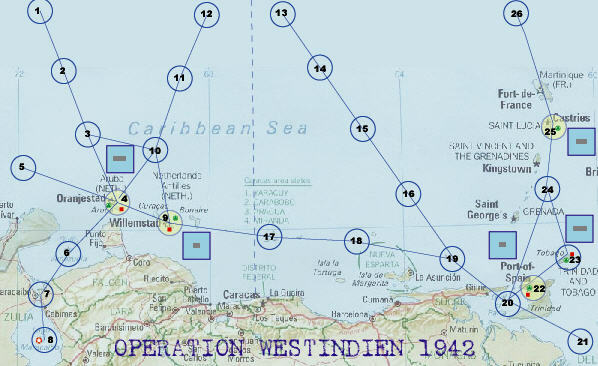 While Operation Paukenschlag (an upcoming ATO game) began along the US East Coast at the same time (equally devastating), a handful of U-boats, Group Neuland, were ordered to deploy in the Caribbean. Unknown to most today, in 1942, the oil refineries at Aruba, Curacao, and Trinidad were vital in refining the oil arriving from Lake Maracaibo, Venezuela. Canada heavily relied on this oil, the US and England, also needed this oil for aviation fuel. For the Germans, it was a missed opportunity to really devastate the Allied oil and fuel production, which would have long lasting impact on the war. Unique rules cover: Aircraft ASW radar, U-boat surface and sub-surface strengths and speeds, U-boat fuel limitations, Torpedo and U-boat surface attacks, Lake tankers, Cargo ships, B-18, A-20 bombers, Destroyers, ASW Ships, Landing saboteurs, Port Capacity. Unlike every submarine game made, this game forces both players to complete different objectives. For the German, it is to sink cargo and oil tankers in demanding quantities and or destroy oil refineries, depending on orders. The German must find and sink tankers with oil cargo moving to refineries. For the Allied player, they must move their oil and cargo ships across the map. Oil tankers must land at a refinery, unload the oil, refine it, reload it and then move the tanker off the map with the oil through U-boat infested water. Cargo ships with non-oil material must also cross the map. Of course, their other objective is to use their bombers and meager ASW force to sink U-boats! Michael Barlow 8 7 8 Interesting subject. Okay map. Counters range from functional to unusual. Americans need a separate victory condition other than preventing the German's victory conditions.